9 human personality types, and of the ways that each of our personalities shift under varying circumstances. Our personality is a lens made of thought structures through which we view the world. Once we become aware that this lens we are looking through is simply thought, and not actually reflective of reality, we are able to know ourselves at a deeper level, and see the world and others with new eyes, and an open heart. 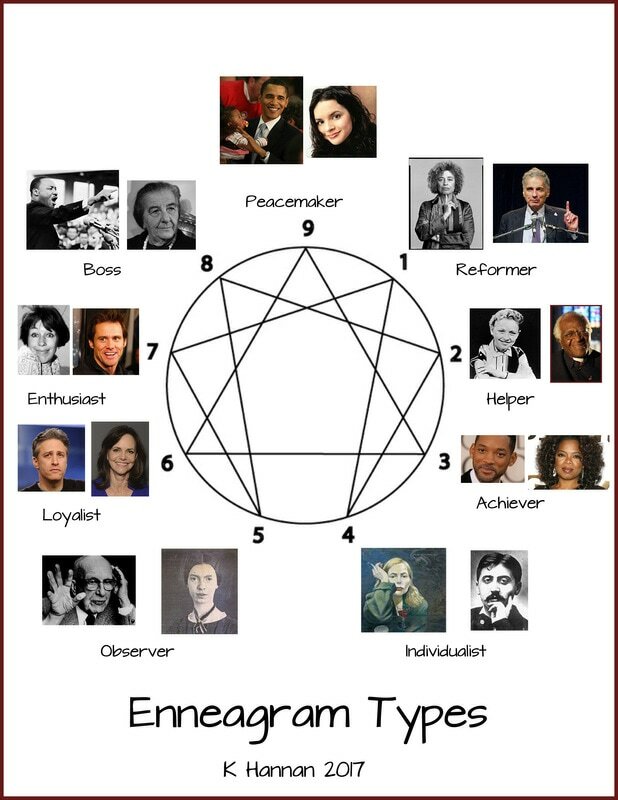 I love using the Enneagram with Byron Katie Work clients to add another dimension of insight into and liberation from our habitual thinking patterns. An introductory Enneagram session takes 90 minutes or so, and the fee is $100. up an introduction to the Enneagram session. You can bring a friend for the same price! The chart below has some photos of people whom I believe have the different Enneatype personalities. I cannot be sure about all of them, but I sure had fun collecting them!